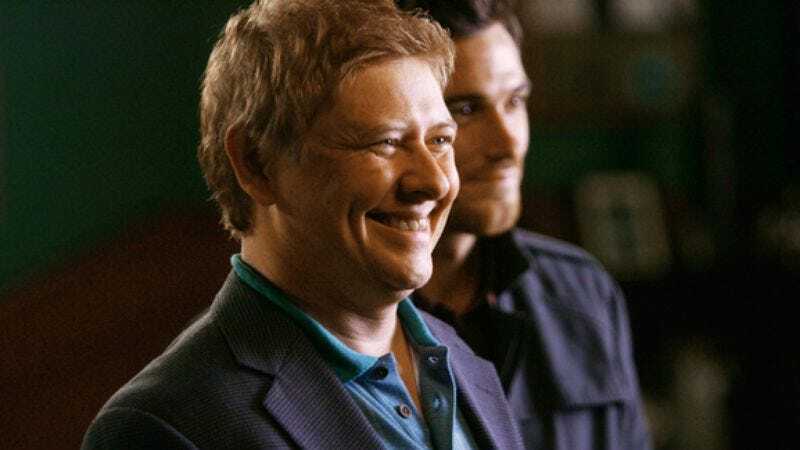 The actor: With his boyish good looks and wry delivery, Dave Foley was pegged as the breakout star of beloved Canadian sketch-comedy troupe The Kids In The Hall. He followed the group’s eponymous show and its 1996 spin-off movie Brain Candy with a leading role in the beloved comedy NewsRadio, which ran from 1995 to 1999. In 1998, he voiced the lead character in the Pixar hit A Bug’s Life. Since then, he’s alternated between voiceover work and supporting roles in television (Will & Grace, The New Adventures Of Old Christine, Scrubs, Robson Arms) and films like Monkeybone, Sky High, and Uwe Boll’s notorious 2007 comedy Postal. Foley recently appeared in the slice-of-life observational comedy The Strip, which is currently in theaters, and reunited with his Kids In The Hall troupe-mates for the eight-part miniseries Death Comes To Town—Foley was having lunch and drinking Bloody Caesars with fellow Kid Kevin MacDonald during the interview. The series will air on Canadian television early next year. Dave Foley: Nothing much interesting about that, because they just asked me to do it and I liked them. [Laughs.] So I said yes. The only interesting thing about it, the only thing that was out of the ordinary, was right before I shot the film, I shattered the big toe on my right foot. I dropped a 40-pound concrete umbrella base on my toe right before we started shooting. So for the entire movie, all the bones in my big toe were broken, so every time you see me walking, you can be aware that I am, at that moment, re-breaking every toe in my foot. The A.V. Club: So you were in excruciating pain. DF: I was, I was in absolutely… the kind of pain that makes you cry. That kind of pain. Yeah, every time I’m walking, I’m breaking all the bones in my toe. Because you can’t set a toe, you know? You can’t put a cast on a toe or anything like that, so basically, if I walked without limping, I was bending my toe and all the bones were cracking again. AVC: Did you think about having that written into the script so you’d have an excuse to sit down? DF: No, it didn’t seem like there was a convenient way of doing it, so I just kept a wheelchair at the ready. As soon as they would call cut, somebody would wheel a chair up and I would sit in it and put ice on my foot, and slowly rock back and forth in pain. DF: Yeah, but still a very pleasant shoot regardless. Really nice, great group of people, great cast, and first-time director Jameel Khan was really great to work with. So it was very pleasant, except for the excruciating pain. DF: High Stakes was a very bad movie that I was cast in as a lead. It was my first film job, and I had to screen-test for it in Vancouver. I was flown out to Vancouver, and they brought up two actors testing for the male lead and two actresses testing for the female lead, and the other actor who was testing for the male lead was Keanu Reeves. AVC: Did you bond with Keanu Reeves over the course of that weekend? DF: Yeah, and I had met him before. He was like a kid, really. He was a little bit younger then me, so when you’re in your early 20s, a few years makes a big difference. I was only 21 when I did… Yeah, I think I was 21 when we shot High Stakes, 22 when it came out, so he was probably 18, 19. AVC: That was before Kids In The Hall, right? DF: It was before we had a TV show, yeah, but Kids In The Hall was a troupe at that time and had a following in Toronto. That was the year Mark [McKinney] and Bruce [McCulloch] were writing for Saturday Night Live, and then I went off to do High Stakes, which used to get played a lot on Comedy Central. They used to have this thing called “Master Cheese Theatre” where they find early movies with people that aren’t very good and run them. And things get run quite a bit on Comedy Central. AVC: Do you get royalties from that? AVC: So you don’t get a check for 23 cents every couple of months? DF: I probably did, yeah. AVC: What was it like to be carrying a movie at such a young age? DF: Oh, it was great. It was a great experience. It was amazing, because I was a huge film buff, so this was my chance to learn how to make a movie. So I just hung out on the set constantly bothering everybody on the crew, asking everybody what they were doing every minute. It was a great experience, and I learned a hell of a lot about how you make a movie, and learned a little bit about how you act for film, you know? So it was great. I think I got four years’ worth of education in a couple of months. DF: Yes, that was part of my summer of doing one line to make rent every month. The casting director took a liking to me, so he would find me a day’s work on anything that came through Toronto, so I’d work about once a month and make enough money to pay rent and buy food for the month. AVC: Do you remember your one line in Three Men And A Baby? DF: Yes, that was the first time I worked in the United States. They actually tracked me down—I was in Kenya, and they couldn’t get a hold of me. Finally, when I was on my way home from Kenya, they got a hold of me in my hotel room in London, and faxed me half the script. [Laughs]. So I read it in a hotel room—I was planning to spend a week in London, and I think I got to spend three days there. I liked the script, so I flew to L.A. the next day. It was my first time working for any extended period of time in L.A. I was always a big fan of Julia Sweeney’s, and then her ex-husband, who she wrote the script with, Jim Emerson, became one of my best friends, and the thing I mostly remember from that is, I made a lot of the closest friends I have now, and I’ve had since I made that movie. The godfather of my children, Jay Kogen, who was one of the Simpsons producers, I met then… Rob Cohen, and all these great people. And I met Paul Simms while I was making It’s Pat, and he later wound up casting me in NewsRadio. DF: NewsRadio was fantastic. To walk off The Kids In The Hall and walk into another really strong cast was great. And it was a natural sort of continuation from the work I’d been doing with Kids In The Hall. It was all very strong personalities, and a show that had kind of a punky vibe. We kind of all felt like we were the rebels of network TV. And it was an amazing group of people that obviously had one outstanding tragedy, but other than that, it was just a terrific, wonderful five years. AVC: You said you met Paul Simms while you were working on It’s Pat. Did he write the NewsRadio lead specifically for you? DF: He did. He wrote the character of Dave based on me. He was a big Kids In The Hall fan—he saw a sketch called “Chicken Lady” where I was the straight man. He noticed that as the straight man, I was getting a lot of laughs. He said that’s what he wanted for a sitcom—he needed someone who could play the straight man and get laughs. He wanted a Bob Newhart at the center of the show. So he wrote it with me in mind, and he forgot to tell me about it, and I wound up actually booking a different pilot, which wasn’t as good. But fortunately, I got fired one day after they were trying to cast my wife. So I was able to call Paul and say, “Hey, I got fired from that pilot! Do you have anyone to play Dave yet?” And he said no, so I was able to cross over and do that. AVC: What would you have played on that other show? DF: It was set in a school. I was a school teacher. For six months, they kept offering me the part, and I kept saying “No, I don’t look old enough to play the part.” I am old enough, but I don’t look it, so when they were trying to cast my wife, they decided I didn’t look old enough. They couldn’t find a wife who looked like she’d be married to me, so they fired me. So I’ll always be grateful to Dean Valentine for firing me. DF: Yes, I wrote that with Jay Kogen, who I met while doing It’s Pat, and my friend Dave Higgins, who we had all met because we were on Comedy Central together. He used to be part of a troupe called Higgins Boys And Gruber. Kids In The Hall really liked those guys. We had guested on their show years earlier. The three of us wrote The Wrong Guy… I think we wrote it at the same time we were writing Brain Candy, so I was writing both of those at the same time until I actually quit Kids In The Hall. I remember being very excited, because I was suddenly in a position to hire David Steinberg. I actually went to a dinner meeting to interview David Steinberg, who was one of my boyhood comedy heroes. I used to watch The David Steinberg Show on PBS back when it was a replacement series. I used to watch him host The Tonight Show. And then he had a series in Canada called The David Steinberg Show that was the first place people saw John Candy and Joe Flaherty and Marty Short, Dave Thomas. They were all regulars on The David Steinberg Show before SCTV was on the air. AVC: He was notorious for his appearances on The Smothers Brothers as well. DF: David Steinberg was the reason the Smothers Brothers got cancelled. He did a sermon about Moses and the burning bush, and CBS said if they didn’t cut it from the show, they were going to cancel ’em, and the Smothers Brothers said, “Well, you better cancel us.” So David Steinberg caused the Smothers Brothers to have their TV show cancelled. DF: One of the worst experiences I think of all of our careers. [Laughs.] It was a time where we all were really unhappy and not happy with each other or anything much in particular. Is my career over yet? AVC: No, not by a long shot. DF: I quit the troupe while we were in the final stages of writing Brain Candy, because we were all fighting so much. As I said, I think all of us were going through pretty bad times in our personal lives, and then we weren’t thrilled with each other in any way, so for the most part, it was a pretty horrible experience. I think the movie turned out better than I thought it would, but I don’t think any of us are completely satisfied with Brain Candy, and I know none of us ever wanted to relive that experience. AVC: There’s an original cut that’s substantially different than the version that got released. DF: I think the original cut was four hours long. I think there is a four-hour version somewhere being bootlegged around. I’ve never seen that version, but yeah, it changed quite a bit. But now we’re working together again and actually having a good time, having a great experience. We just did a miniseries together up in Canada. Which actually, that’s what I was at now. We were at the prep launch today for the Kids In The Hall eight-part miniseries. And that was the complete, almost the antithesis of the Brain Candy experience. It was, I think, probably the happiest work experience we’ve had since the early days of the TV show. AVC: Do you think it’s because you’re older? Maybe a little more mature? DF: We’re older, and we’re doing it because we want to do it. It’s not like a life-or-death struggle, you know? And I think when we did Brain Candy, it was like desperately trying to launch the next phase of the career at a time when maybe we should have just taken a break. AVC: You were actually contractually obligated to appear in Brain Candy, were you not? AVC: So you had no choice—that had to not be fun. DF: Yeah, I didn’t have a choice. But even then, as bad as it was, there were moments where we did have fun, like in performance. Some things that we did I thought were fun to do. But it was a lot of… It was a very unpleasant set. DF: Yes, Monkeybone’s a very bad movie that I was in. With a very lovely man named Brendan Fraser and a very lovely woman named Bridget Fonda. Two very delightful people, and probably a good sign that the movie wasn’t going to be successful is that I was the only one naked in it. There’s a scene where I’m running through the Museum Of Natural History and I have to run, naked, through 200 extras. That was the first time I’d ever been naked on camera. The second time actually I was naked in From The Earth To The Moon. AVC: So what you’re basically saying is you’re naked in all of your movies. DF: It’s getting to be that way. AVC: You and Harvey Keitel. DF: Yes, people that are naked in movies where you really wish they wouldn’t be. AVC: Monkeybone seemed to have a lot of potential. The director, Henry Selick, otherwise has an impressive résumé: The Nightmare Before Christmas, Coraline. What do you think went wrong? DF: I think the movie just never really found its focus, and I don’t think Henry was good at directing live actors—he’s a stop-frame-animation guy. So he didn’t really know how to let actors act with each other, because he’s used to that microscopic level of control. So the scenes lack a natural energy. It just felt like there was no opportunity to really connect with each other as actors. AVC: Yet there are former animators like Tim Burton and Frank Tashlin who had enormous success directing live-action movies. DF: Yeah. And Henry did a great job on Coraline, and James And The Giant Peach, and Nightmare Before Christmas, great pieces. DF: Sky High, which Kevin McDonald was in too, as Mr. Medulla. Kevin McDonald: Mike Mitchell was an animator, and he could direct people! DF: Yes, that is true. Mike Mitchell did animation and was great directing us. He was really fun to work with. Maybe because he also did work with puppets, and that helped create a segue to live-action. But yeah, that was a really fun movie to do. And working with Kurt Russell was great. DF: Bruce Campbell was brilliant. Yeah, I got nothing. DF: It was fun, because Dave Thomas is an old friend. I love Dave and love hanging out with Dave. Even though it was Edmonton in February, which is really not a good idea, to be in Edmonton in February. The only place worse would be Winnipeg, where Kevin is spending his winter. But it was just fun—I love Dave, I was a huge SCTV fan, and Dave had done me a favor in the past, too, of being in my Christmas special up in Canada, which Kevin was also in. So it was just a delight to work with Dave. DF: I’ve seen some rough cuts of the Kids In The Hall miniseries now. I’m very happy with it. It was an eight-part narrative miniseries that we did for the CBC and that we shot up in a small town in Northern Ontario, and I think it’s gonna compare favorably to any TV we’ve ever done. Everyone was really funny and in great form, and we did some really good work. So hopefully that will sell in the States. It’s going to start airing up here in Canada in January. We’re still finishing post-production. But it’s a story of death personified, stuck in a small town, and all the people in that town revolving around a murder, and… [Laughs.] Kevin’s just applauding his Bloody Caesar. And that’s it, really. It’s very funny.